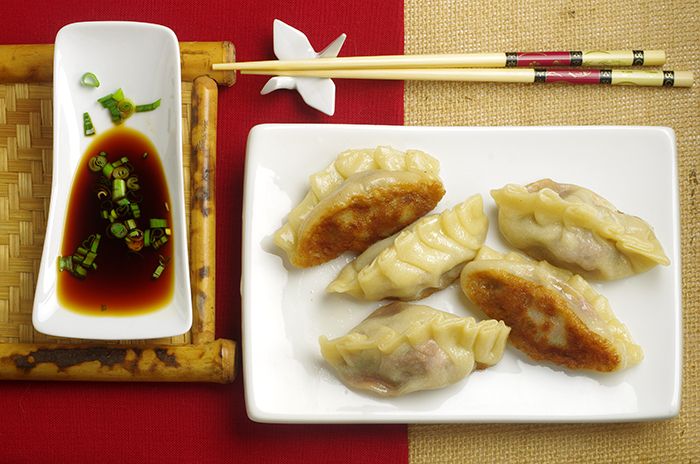 I first tasted pot stickers in the late 1980s at the tiny Mandarin Deli in Los Angeles’s Chinatown. Behind the glass window, a dumpling maker steadily worked, rolling out thin wrappers, filling them, and creating large pea pod-shaped dumplings. I watched intently, distracted only when my fragrant pot stickers arrived. The hearty dumplings were so hot that I burned my mouth, but they were well worth the minor injury. Pot stickers supposedly started out as boiled dumplings that a chef forgot about in the wok (guo) and they stuck (tie) after the water had cooked away. His guests loved the contrasts between succulent filling, tender-chewy skin, and crusty bottom, and thus the pot sticker was born. The modern way to mimic the chef’s delicious accident is to cook pot stickers in a skillet with water and oil, which steams the dumplings and fries their bottoms to a golden, toasty finish. They are technically called jianjiao in Chinese, which means shallow-fried dumplings; but in the West, we commonly know them as pot stickers and panfried dumplings. 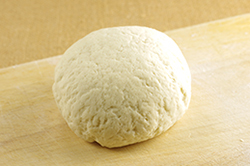 “Fried” dumplings can be panfried or deep-fried. 1. 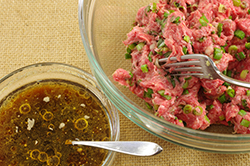 To make the filling, combine the beef, Chinese chives, and ginger in a bowl. 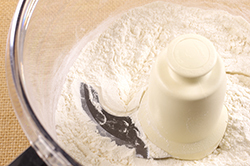 Use a fork or spatula to stir and lightly mash the ingredients so that they start commingling. 3. Meanwhile, form 16 wrappers from half of the dough. Aim for wrappers that are about 3-1/4 inches in diameter. 5. 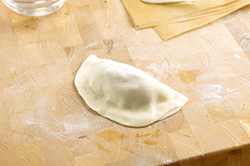 For each dumpling, hold a wrapper in a slightly cupped hand. 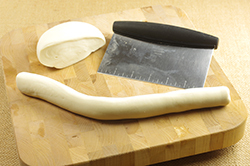 Scoop up about 1 tablespoon of filling with a bamboo dumpling spatula, dinner knife, or fork and position it slightly off-center toward the upper half of the wrapper, pressing and shaping it into a flat mound and keeping about 1/2 to 3/4-inch of a wrapper clear on all sides. 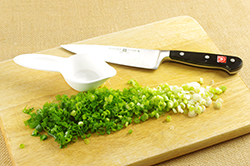 Fold, pleat, and press to enclose the filling and create half-moon, pea pod, or pleated crescent shapes. 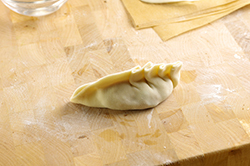 Place the finished dumpling on the prepared baking sheet. 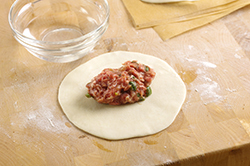 Repeat with the other wrappers, assembling the dumplings and spacing them a good 1/2-inch apart on the baking sheet. 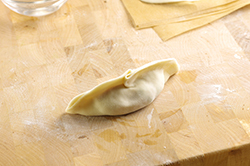 Keeping the finished dumplings covered with a dry kitchen towel, form and fill the wrappers from the remaining dough. 6. 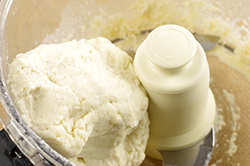 Once all the dumplings are assembled are assembled, they can be covered with plastic wrap and refrigerated for several hours; they can be cooked straight from the refrigerator. 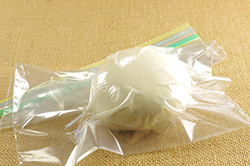 For longer storage, freeze them on their baking sheet until hard (about 1 hour), transfer them to a zip-top freezer bag, pressing out excess air before sealing, and keep them frozen for up to 1 month; partially thaw, using your finger to smooth over any cracks that may have formed during freezing, before cooking. 7. 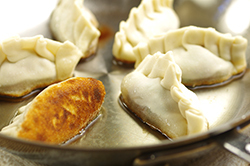 To panfry the dumplings, use a medium or large nonstick skillet; if both sizes are handy, cook two batches at the same time. 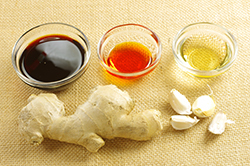 Heat the skillet over medium-high heat and add 1-1/2 tablespoons oil for a medium skillet and 2 tablespoons for a large one. 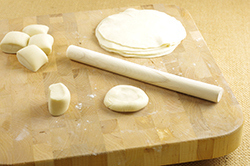 Place the dumplings 1 at a time, sealed edges up, in a winding circle pattern. The dumplings can touch. 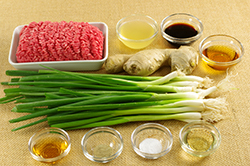 (In general, medium skillets will fit 12 to14 dumplings large skillets will fit 16 to 18 dumplings.) 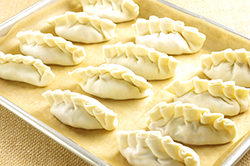 Fry the dumplings for 1 to 2 minutes, until they are golden or light brown on the bottom. 8. Holding the lid close to the skillet to lesson the dramatic effect of water hitting hot oil, use a kettle or measuring cup to add water to a depth of roughly 1/4-inch; expect to use about 1/3 cup of water. The water will immediately sputter and boil vigorously. Cover with a lid or aluminum foil, lower the heat to medium, and let the water bubble away for 8 to 10 minutes, until it is mostly gone. After 6 to 8 minutes, move the lid or foil so that it is slightly ajar to allow steam to shoot out from underneath. 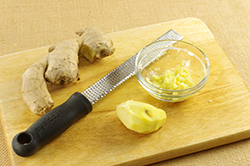 This lessens the drama of condensation dripping down onto the hot oil when you remove the lid. When you hear sizzling noises (a sign that most of the water is gone), remove the lid. Let the dumplings fry for another 1 to 2 minutes, until the bottoms are brown and crisp. 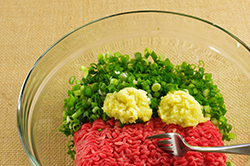 Turn off the heat and wait until the sizzling stops before using a spatula to transfer the dumplings to a serving plate. Display them with their bottoms facing up so that they remain crisp. 9. 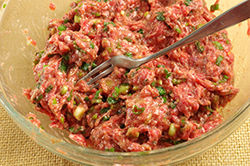 Serve with the dipping sauce in a communal bowl for people to help themselves or divided up among individual rice bowls or large dipping sauce dishes. 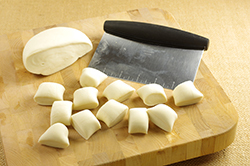 Eat these with chopsticks in one hand and a spoon or rice bowl in the other to catch any drips of dipping sauce or juices that spill out when you bite into the pot sticker.